Bring the outside inside with a stunning exterior panoramic photograph, shot in super high-definition and blown-up to monster size. DWP Imaging is a specialist panorama photographic studio. Panoramic shots are required when the field of view is immense. Sometimes there is no way that just one shot can capture the desired scene so, in these instances, we shoot and stitch multiple high resolution photographs. Panoramic, it's a phrase commonly used to indicate several photographs that have been taken consecutively and 'stitched together' to make one long thin photo. Our panoramic shots are ultra high definition, completely free from distortion and are perfect for creating office wallart prints. All of the panoramic photographs above were shot, on location throughout Hertfordshire, Bedfordshire and Buckinghamshire, by DWP Imaging Ltd. We're part of the Commercial Photographers Network and we were commissioned by NatWest Bank (RBS) to create panoramic images of over 70 provisional towns between Spring 2014 and Autumn 2015. Our images can be seen as massive blow-ups installed behind ATM machines during a rolling branch refit programme. The challenge was to create images of pictorial/historical/social and geographical interest. Some of the towns and cities on our list, particularly in boroughs of London sit cheek by jowl to one another. Politically, who in Edgware for instance, wants a photograph in their local NatWest branch of Hendon RAF museum? Even though it is very attractive. Lots of challenges were to be overcome whilst carrying out this project and nationally we all were all able to share experiences with one another. There were obvious restrictions on what we could and couldn't feature within the photo content. General public in most cases were to be avoided, as were lots of moving traffic and branding. Towns also wanted to make it clear that their patch was best, so no empty retail units were to feature either. On the technical side, all of our photographs has a specific use, the largest 'stitch' covering an area of up to 14 metres x 2.4 metres, all with ATM units in front and some going over several elevations. Using specialist equipment to remove parallax and a high-end camera that happily produces files large enough to meet the demands. The panoramic photographer has to work quickly, particularly if the wind is whipping the clouds across the skies. In some cases a number of images were taken left to right, then a new row above the first, right to left and then maybe a new selection left to right again but below the first set. This may have given up to 30 frames that would stitch in Photoshop to create a very large file. The added problem of lots of moving subjects like people or traffic was overcome by taking more than one picture of the same part of the image. 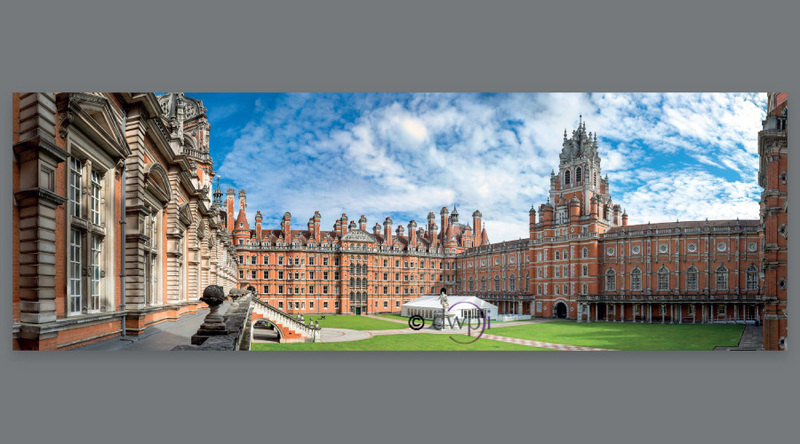 Stitching brings new challenges and we spend a great deal of time with panoramics keeping the bending of the uprights to a minimum without losing the obvious natural panoramic look. These are 'monster panos' and after careful retouching to remove any ghosting, Photoshopping out the litter and vandalized bits, making good any bad grass areas, we end up with massive file sizes, all of which are good enough to withstand the close scrutiny they will get at NatWest cashpoints. The outcome is that the client and customers are blown away with the quality of the photographs. Each branch of NatWest has a welcome panel made up of a panoramic image and we also supplied a selection of gallery images that now adorn the various branches. With careful planning to sync with the rolling programme of refits, we can protect budgets so that clients aren't hit with a bill for 70 panoramic shots in one go.